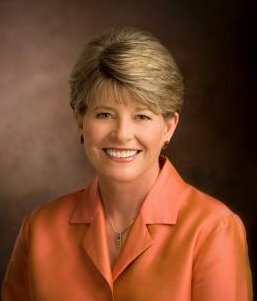 Mary Nielsen Cook was called as the First Counselor of the Young Women's Presidency of The Church of Jesus Christ of Latter-day Saints (Mormon Church) in April, 2008 and was released in April 2013. She had previously served in the General Young Women's Presidency under Susan W. Tanner. Mary was born on June 8, 1951, in Midvale, Utah, to Kenneth N. and Fern S. Nielsen. Her father suffered severe health problems resulting from a mining accident when Sister Cook was a toddler. For a time, her mother was the family’s sole provider. She earned undergraduate and graduate degrees from Brigham Young University in audiology, speech pathology, and education. In her professional career, she was a school administrator and a special education teacher. She married Richard E. Cook on July 16, 1988. Richard Cook had been a widower since 1984. Cook has no biological children, but she is the step-mother to Richard Cook's four children. Cook says she “inherited four wonderful children and became a grandmother of eight.” They now have 17 grandchildren. Elder Cook would later serve as a general authority of the LDS Church from 1997 to 2001; he is currently the finance director of the church's Perpetual Education Fund. In the early 1990s, the Cooks served in Mongolia as LDS Church missionaries. In July 1995, when the Church created the Mongolia Ulaanbaatar Mission, Richard Cook was asked to be the first mission president. Mary Cook served with her husband in Mongolia until 1998. The Cooks would later live in Hong Kong, China, while Richard served as a member of the presidency of the Church's Asia Area. This page was last edited on 4 March 2015, at 12:21.